The first crop of good tomatoes finally made it to the farmers’ market. And to my great surprise, I found that my Plant It Forward farmer, Sarment had San Marzano tomatoes in his basket. According to Wikipedia, San Marzano tomatoes originate from the small town of San Marzano sul Sarno, near Naples, Italy, and were first grown in volcanic soil in the shadow of Mount Vesuvius. If I have to use canned tomatoes, these are the only ones I use. These San Marzanos were grown in Houston, with no volcanic soil in sight. But everything Farmer Sarment grows is delicious. So I bought a few intending to showcase them in a no-cook tomato sauce as we hit our first 90 degree days for the year. Using the best and freshest ingredients in this dish is a must as each flavor shines and nothing is hidden. Using store bought tomatoes that have been held in cold storage for several weeks with no flavor, aroma or taste, is not advised. Fresh tomatoes from your garden or a local farmers’ market are the best choice. The olive oil should also be very good quality and have a rich flavor. For this recipe I use Iliada Organic Extra Virgin Kalamata Olive Oil (you can usually find this in import markets or online). The pasta also deserves some attention. I prefer a dry pasta here as it lends some tooth to the soft texture and lightness of the sauce, and using a good organic wheat variety is warranted. Use fresh pasta if you prefer. The parts blend together to form a simple, delicious dish. The sauce is extremely light and flavorful. 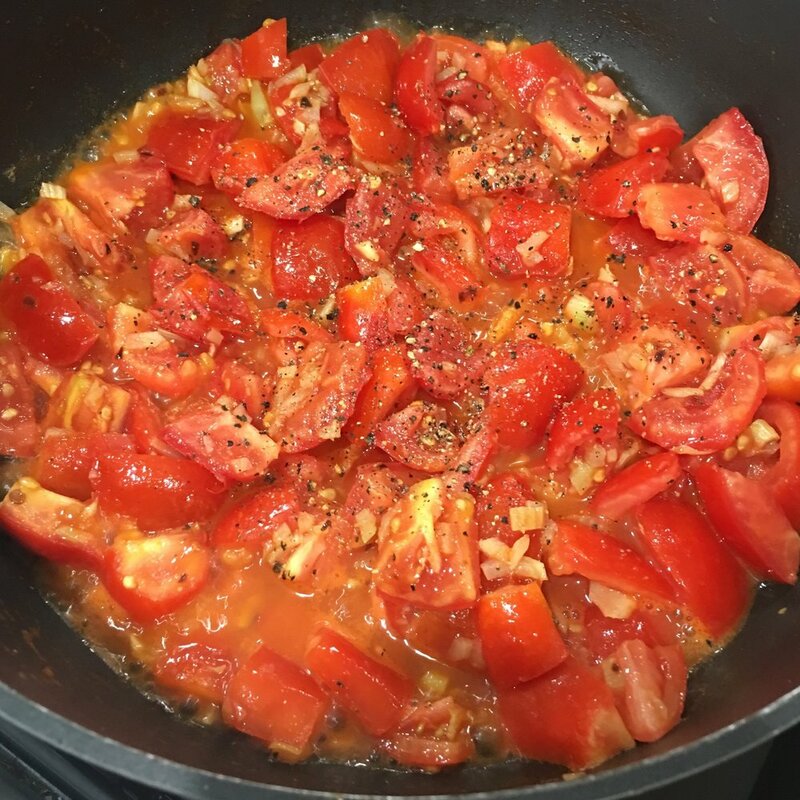 The tomatoes macerate in the oil and lend their flavor to the sauce without fully breaking down, so its really more of a tomato oil that coats the pasta with lovely bits of tomato along with it. A little crusty bread will help you lap up every last drop. The olive oil helps us absorb the vitamin A from the tomatoes. The tomatoes are also a rich source of vitamin C and lycopene. The pasta provides magnesium, several B vitamins, including thiamine (B1), which are necessary for brain health and memory. As spring gives way to summer, what better way to lighten our spirits and our dishes than avoiding time at the stove. Just a pot to boil the pasta and a big bowl to macerate the tomato sauce is all you’ll need to get a healthy and delicious meal on the table. Combine all ingredients in a large bowl (big enough to fit the pasta and toss)and let sit for at least 30 minutes and up to 2 hours. The longer it sits the better it gets. Add the well-drained cooked pasta and toss. Serve topped with grated parmigiano regiano, and a few more basil leaves.